If you are interested in understanding the folk culture of Kerala, a visit to Kerala Folklore Theatre And Museum would be worth your time. At the first glance, the Kerala Folklore Theatre & Museum at Kochi, Kerala might be mistaken for a traditional Malabar mansion. Although the museum has quite a low floor space area, but each and every corner and crevice is filled with artefacts. It’s perfect for families with kids, and for those who really like to get into the culture and traditions of a place. The Folklore Museum is based on traditional architecture of the north Malabar region of Kerala. The museum, which itself is a work of art, is made of a blend of teak, rose wood and metal and it comprises of three floors. The ground floor is imbued with the historical and religious diversity of Kerala with exhibits from Hinduism, Islam, Christianity and Buddhism. The corners of the staircase, which lead to the first floor, are also decorated with wood carvings in relief. Artefacts that are part of south Indian fine arts and folk culture are displayed in the first floor. The main attraction of the first floor exhibits are the fascinatingly intricate theyyam masks.The uppermost floor is a theatre hall with rows of old-school wooden chairs placed in front of a raised wooden platform. Traditional colourful ornate wooden pillars are placed at the corners. The ceiling on this floor is covered with 253 mural paintings. The paintings depict the different art forms of Kerala and also scenes from various mythological stories.Artisans from all over Kerala were commissioned to work on these paintings. 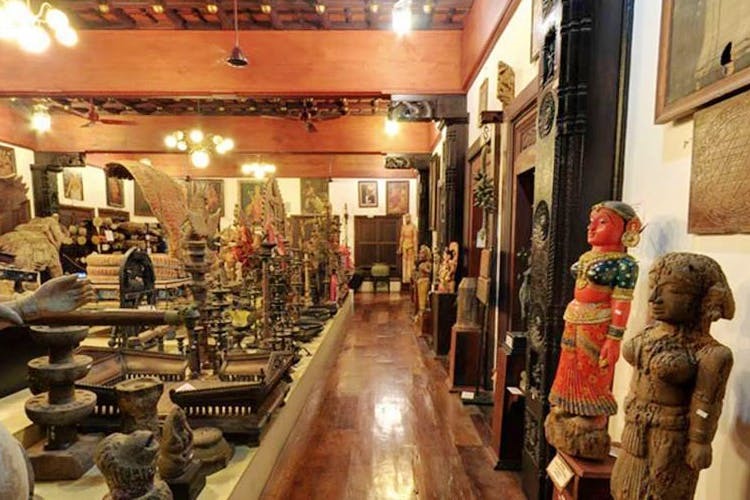 Unlike a majority of the museums some of the artefacts, like the theyyam masks, in the Kerala Folklore and Theatre Musuem are available for sale. These masks and the other objects available for sale have been specially made for display in the museum and are not sourced from any place of historical significance. If you are in Cochin, you can hire a cab and visit the museum. The museum is open all seven days of the week from 9 AM to 6 PM.